Having trouble mastering the art of eating with chopsticks? Then check out this cool new All-in-One Bamboo Chopsticks + Fork. 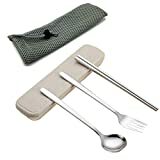 This handy reusable utensil lets you practice using chopsticks while dining and, when you run into trouble, can be easily flipped around to use the built-in fork on the other side. Also great for veteran chopstick users who have trouble grabbing at that last little bite. Hmm, they should have put a spork at the end instead to really mix it up. Great for a Sushi Lover!